I find spring to be one of the most fascinating times in the botanical world. Perhaps more dramatic in the north, as we crawl out from under winter (this year, we ran), the awakening of the sleeping underground helps us come alive, too. Each day brings a new gift. 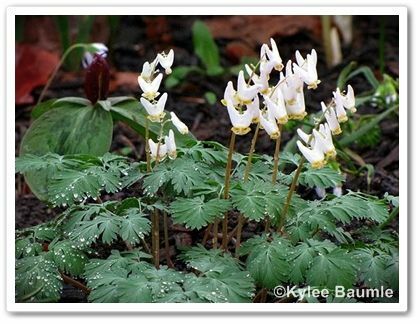 Dutchman's breeches (Dicentra cucullaria) and Trillium sessile. This year, it was almost like when Dorothy opened the door to her house after it landed in Oz. There was no transition into spring; we went from gray and brown to a rainbow of colors in an instant. We delight in this assault to our senses, but we mustn't blink or we'll miss something. These spring flowers aren't used to sustained temperatures in the 80s and they wilt under the heat. Last week, as I walked the woods and the banks of the creek near us, a small white spot caught my eye. I walked to get a closer look and the clasping leaf at its base told me it was bloodroot. I'd never before seen it in this place that I'd walked a hundred times before. There was just one, though I knew in an undisturbed place such as this, there had to be more. 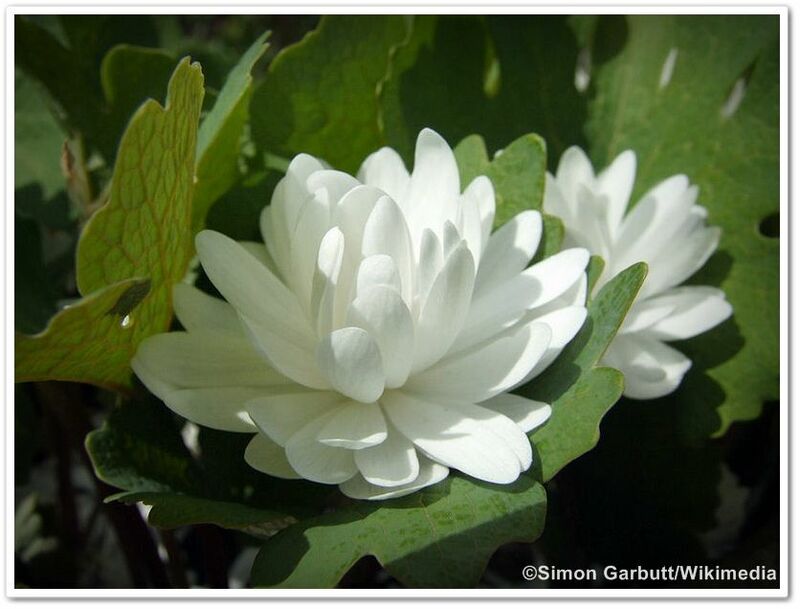 Bloodroot (Sanguinaria canadensis) is an interesting plant. 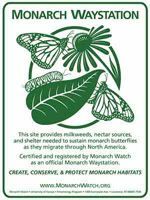 It's the only species in its genus and is found in the eastern United States and Canada from Nova Scotia to the Great Lakes, all the way down to Florida. 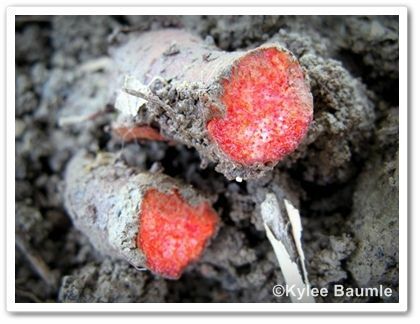 It gets its common name from its orangey-red root that seems to ooze "blood" when it's broken or cut. Flowers appear from March to May, before the foliage, which unfolds once the bloom opens. The blooms don't last long - just a day or two - when they're pollinated by small bees and flies. The seed pod then forms, matures and opens, and the seeds are dispersed by ants, which take them to their nests, where they remain until they germinate. This process is called myrmecochory. Deer like to munch on these plants, so perhaps that's why I never noticed them before; the location where I found the bloodroot this week is a popular deer hangout. Bloodroot is ephemeral, meaning they only last for a short time and then they go dormant and disappear until the next spring. 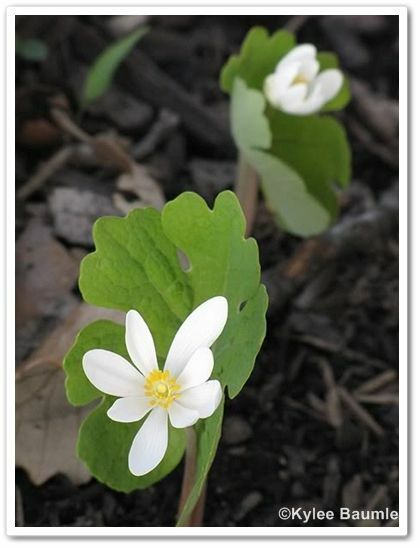 There's a double form of bloodroot too (S. canadensis forma multiplex), which I have yet to add to my wildflower garden, but if I ever come across it at a nursery in my travels, you can be sure I'll buy it. 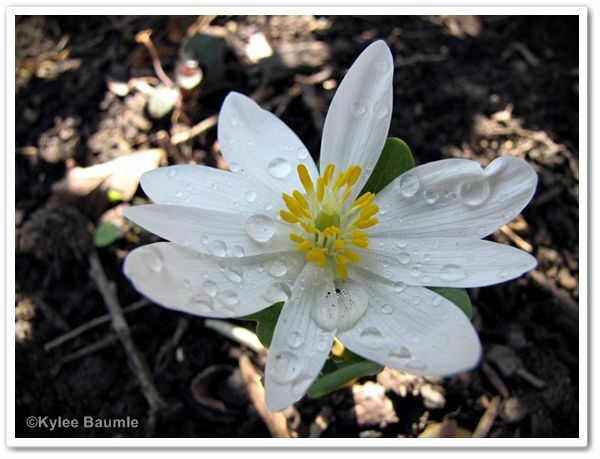 Note: Bloodroot may be a protected species in your location. 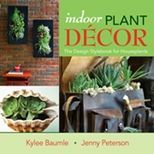 Please check before relocating plants found in the wild. This post is part of the meme, Linnaeus Day, created by Christopher Tidrick (From the Soil). 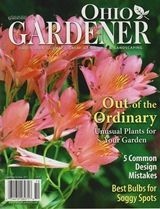 Each month on the 23rd, garden bloggers delve more deeply into the history and characteristics of a plant in their own gardens. Visit Chris's blog to find more Linnaeus Day posts. 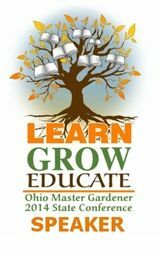 I admired double bloodroot in a garden that I visited last spring and it has been on my wish list ever since. Very interesting information on Pulmonarias too. Jennifer ~ Thanks! Yes, that double is really frilly and gorgeous, isn't it? Jen ~ I've never run across one for sale...yet! I hope I do though. I dug some in the woods several years ago and moved them north of my summer kitchen and love seeing them bloom this week. So beautiful, you gave me info about them I didn't know. Thanks. 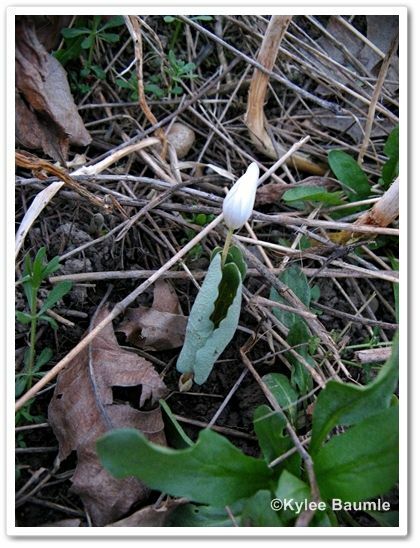 I ♥ bloodroot and have quite an established patch of it hidden in one corner of my property. 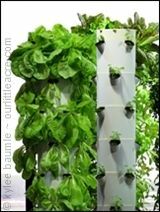 I look forward to seeing its white flowers every spring! Beautiful! I like the flowers and the foliage as well. I'll have to add some to a shady area. Thanks for the info! I did a nature hike yesterday and our Dutchman's Breeches were all done blooming. :-( We did find a lot of other spring beauties! Love that double bloom. 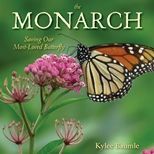 Kylee, Yet another interesting post! !